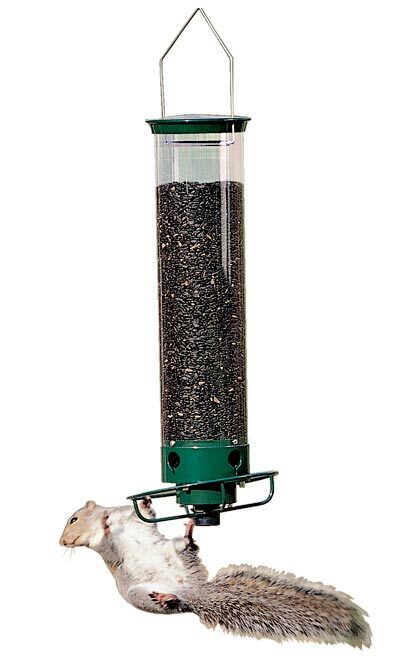 The Droll Yankees Yankee Flipper Squirrel Proof Bird Feeder is the definitive squirrel proof bird feeder, and a lasting source of entertainment in your backyard. Birds love to eat from it, but grey squirrels are prevented from dining in a way that will make you smile. The weight activated feeding perch is calibrated to dramatically react to the weight of a grey squirrel. When this creature steps on the perch, an internal motor spins it, flipping the marauding squirrel off the feeder. The sturdy, metal cap adds extra protection, preventing squirrels from reaching seed from the feeder top, while an internal baffle design keeps feed flowing freely to the four base ports. The clear feeder reservoir is made of UV stabilized polycarbonate for long lasting durability without yellowing, and the cap and feeder base are crafted from green, powder coated metal. A casing around the motor and batteries protects them from moisture, and the unit easily turns on and off via a knob on the battery pack. This bevy of features has made the Yankee Flipper a classic, durable, and favorite addition to bird gardens everywhere. Hang this unit from its looped, stainless steel wire for a stable and secure display, and to reduce motion. The item comes equipped with rechargeable battery and a battery charger. Discourage squirrels from feeding and add some fun to your backyard with the Yankee Flipper Squirrel Proof Bird Feeder. Lifetime warranty on feeder. Limited warranty on motor and battery. The Yankee Flipper works well to prevent access by grey squirrels; however, red squirrels and chipmunks are not heavy enough to activate the perch ring. If red squirrels are coming to your feeders, we suggest the Yankee Whipper or Yankee Dipper.